(Nanowerk News) A new form of platinum that could be used to make cheaper, more efficient fuel cells has been created by researchers at the Department of Energy's SLAC National Accelerator Laboratory and the University of Houston. The process, described in the April 25th issue of Nature Chemistry, could help enable broader use of the devices, which produce emissions-free energy using hydrogen. "This is a significant advance," said scientist Anders Nilsson, who conducts research at the Stanford Institute for Materials and Energy Sciences, a joint institute between SLAC and Stanford University. "Fuel cells were invented more than 100 years ago. They haven't made a leap over to being a big technology yet, in part because of this difficulty with platinum." 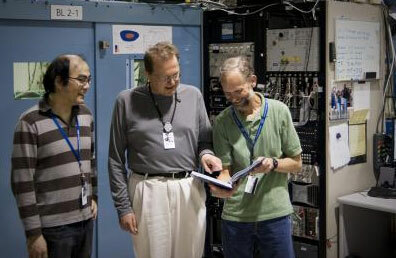 Researchers including Hirohito Ogasawara (left), Anders Nilsson (center), and Mike Toney (right) used the bright X-ray beam at SLAC's Stanford Synchrotron Radiation Lightsource to study a new form of platinum that could be used to make cheaper, more efficient fuel cells. Fuel cells hold significant promise for clean energy because the cell's only byproduct is water. But current fuel cell designs can require as much as 100 grams of platinum, pushing their price tags into the thousands of dollars. By tweaking platinum's reactivity, the researchers were able to curtail the amount of platinum required by 80 percent, and hope to soon reduce it by another 10 percent, greatly trimming away at the overall cost. "I think with a factor of ten, we'll have a home run," Nilsson added. Fuel cells work much like batteries—an anode provides electrons and a cathode collects them on the other end of an electrical circuit. But unlike batteries, fuel cells use hydrogen and oxygen to drive their energy-producing reactions; when oxygen enters the metal cathode, it is broken down into individual atoms before it forms water with hydrogen. The choice of metal for the cathode is extremely important, as some metals cannot break apart the oxygen atoms while others try to bind too strongly to the oxygen atoms, taking them away from the key reaction. Scientists seek the perfect "balance point," where the number of oxygen bonds broken is maximized and the oxygen atoms bind more weakly to the catalyst. They achieved the balance with platinum, which is strong enough to break the oxygen bonds but does not bind to the free oxygen atoms too strongly. Unfortunately, it also costs enough to make platinum-electrode fuel cells untenably expensive. In 2005, University of Houston researcher Peter Strasser started looking for ways to crack the platinum problem not by replacing platinum outright, as other researchers sought to do, but by making platinum more reactive. To do this, Strasser and colleagues used a process called dealloying. First, they combined platinum with varying amounts of copper to create a copper-platinum alloy. Then they removed the copper from the surface region of the alloy. When they tested the binding properties of the dealloyed platinum-copper catalyst, they found it was much more reactive than it would be otherwise. To find out why, Strasser, Nilsson and colleagues Mike Toney and Hirohito Ogasawara put dealloyed samples under the extremely bright X-ray beam at the Stanford Synchrotron Radiation Lightsource. By studying how X-rays scattered from the dealloyed samples, they were able to create detailed pictures of the metal's internal structure, revealing that the increased reactivity was caused by lattice strain—a phenomenon in which the arrangement of platinum atoms is modified. By compressing the surface platinum atoms closer together, the process causes platinum atoms to bind a little more weakly to oxygen atoms and inch closer to that magical balance point between molecule dissociation and catalytic binding. "The distance between two neighboring atoms affects their electronic structure," Strasser said. "By changing the interatomic distance, we can manipulate how strongly they form bonds." The next step for the researchers will be to use the SSRL beam to get a closer look at the reactions between oxygen and platinum, and to determine what can be done to make the process even more efficient. The ultimate goal is to create a potential replacement not only for gasoline engines but also for the batteries found in small electronic devices.